Amazing Adaption, maybe even better than the Drama! I already liked the live-action movie some years back, so I was of course looking forward to this Anime. And it blew me away! It looks like it's gonna be a direct adaption of the games, and I'm totally fine with that! Additionally, the little changes (Naruhodo a bit more knowledable because there is no player that needs to learn the game, the "Testimony" & "True Story" markers) are wonderful additions. Especially the later ones can surely get interesting in the future: A Testimony scene which looks exactly like the True Story - except for one minuscule detail! Looking forward to how the series progresses! So it's here. 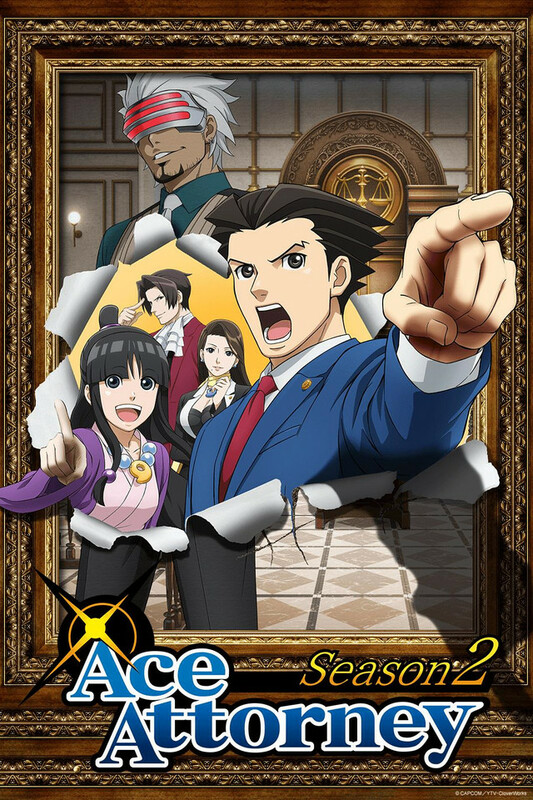 The anime adaptation of Ace Attorney/Gyakuten Saiban, which is a very popular court drama Visual Novel written by Shu Takumi.. Now the question remains for a fan like me. "How did you feel with the first episode?" I'll be honest here, based on my impressions with the first episode. So, honestly..............it's not that good, so far. To summarize The First Turnabout, it is a hollow shell of the actual case. Now you would be thinking "How? It shouldn't be that bad, it is just a tutorial case after all." It follows the case well, very much to the script, however, the execution is not good at all. For a series that juggles both comedy and drama, there is no drama, no urgency in the episode at all. It is indeed true, Phoenix/Naruhodo would act a bit more knowledgeable because there is a lack of a player character to test their ability. However, if this was the case, then the adaptation should e able to stand on its own for the weakness this causes to the episode. Because of the simplicity of the case it should at least be some acknowledgement of its own simplicity to play off the urgency of winning the first case. I don't know, something to change up the tone. However, the trial maintains a monotonous atmosphere that is very boring. Urgency is important, because Naruhodo/Phoenix is a new lawyer, regardless of the player being there or not, it is Naruhodo who goes through all this, not us in any way, shape, or form. Be it the animation or the OST, no urgency is conveyed through the characters. Without urgency, there is no drama, and so the Ace Attorney anime fails on doing the very thing the games were made to do. Pacing on this episode is a little bad too, and things like the break down is just skimmed over. The OST is pretty hit or miss, I find the variations for the Pursuit and Allegro to be dull. Which is funny considering the soundtracks of the Ace Attorney series are all gems of consistently good music. Let's hope that what we witness for episode one isn't the testimony for the whole series. The Anime adaptation for Ace Attorney seems good and stays true to the game but I'm a little confused about why they didn’t keep the part where the Witness Threw his toupee at Ryūichi Naruhod. Also the game's characters acted more realistic. Plus they also did a decent job allowing the spectator "The Person Watching The Show" learn more about the case to a point when they can guess before the statement is said using visual queues. After watching episode one, I can say I'm very happy with this anime adaption. The dialogue and characters were true to the story, and the anime handled the lengthy court proceedings well for a 23 minute episode. Will be looking forward to the remaining season. The animation is pretty good, though it does have the computer-rendered quality to it. It's almost painfully obvious during the sequence when the courtroom is first shown. The characters feel right, as do their voices but it falls flat with the plot in episode one. I had been prepared to dismiss it as just an animated version of the game but with the second episode, there is some addition to the plot so it's more than the base game at its core. It still retells the game's story but with episode two now added on, it fleshes out the plot a bit more. Ace Attorney: Comes to life! A really great start to the series, as I have been replaying them in the last few weeks the case was fresh in my brain, was really nifty to see it come to life. The animation and voices were spot on. My only hope is that as it goes forward it retains all the crazy comedy of the games and we get to see a lot of the dynamic duo Phoenix and Maya! I also really hope there are filler episodes too, an odd thing to say but I would just love to see the characters doing random stuff for the funs. Main Character acts like a child who needs his hand held but is presented as if he is top of his class in law school. The connections made by the attorney is easy and boring. The reactions of other characters after justice was achieved was ridiculous as if winning is more important than Justice. This anime/novel is sub-par unless aimed at children 10 and younger. Doesn't hold onto viewers who never heard of Ace Attorney. I can't say it's perfect, but I think a lot of people are missing the concept here. This review is mainly intended for people unfamiliar with the series. What you have to understand is that this anime is based on games already more than a decade and a half old. This is an equivalent of the FFVII remake, no one is going to be 100% happy. No one played the game exactly the same. A lot of the heart of the game is in the dialog, and there's literally hours of material that could be added to the first episode if you wanted to include choosing to present the wrong item every time it came up. Some of it was hilarious. Some of the most famous quotes and memes in the game are from dialogue you only get from being a terrible attorney. Some of it is just annoying. The point is, no one would watch an anime about three hours of some guy presenting his cellphone every time someone asks him a question. They've tried to take a middle road here. Phoenix isn't the most competent lawyer, he stumbles on the questions that are meant to showcase play style in what is basically a tutorial case, because if he just scrolled through everything and presented where evidence was needed, it would be even more boring than “What was the murder weapon?” *Present lawyer's badge* “What the hell is wrong with you, Mr. Wright?” It's the equivalent of trying to summarize a Choose Your Own Adventure book. You have to leave a lot out. Personality wise, I like Phoenix. I like that they kept his bicycle. It was canon in art, but never showed up in the series. I like that they made him unsure and naive. We're talking about a 24 year old man who decided his entire life's path because someone in fourth grade wasn't a jerkface to him. He loves the hell out of his friends, his boss, and most of his clients, and puts his life on the line for people he barely knows because he's just that naively confident in the power of truth and justice and believing in your clients. He doesn't have a driver's license. He's almost never canonly paid for his services. He can hardly afford to feed his assistant her fast food. He's not a lawyer you would expect. But, you know, sometimes he's the lawyer you need. As far as the way the trials are presented, it's silly. In Japan, they assume it's based on American justice. Here, we assume it's a Japanese thing. Some parts are very Japanese, like the badges, which are actual badges worn during trial to show your status. It's based on a sunflower, because their faces are always supposed to face the sun and a lawyer is never supposed to lose sight of the truth. The large amount of sunflowers in the opening and ending were symbolic of that, especially the ending where it's a metaphor for protecting Maya when she's being trampled by a system that doesn't care. The Japanese legal system is much harsher than most. Juried cases were not mandatory in Japan until the 2000's, long after this series was produced. It's not unheard of for a lawyer to never win a case, or for a judge to never hand down a not guilty verdict. The prosecution really doesn't have the same restrictions with making evidence available to the defense. When the games were made, corporal punishment was still often carried out by hanging. All that said, a lot of the system is total nonsense created to make an interesting play system. Your enjoyment may vary. If you're considering playing the games, you may want to hold off on the anime. A lot of the game is digging through ridiculous witnesses and stupid, seemingly irrelevant facts and evidence in pursuit of that “aha” moment when you realize that, yes, the metal detector is very relevant, and it's a good thing you decided to bring it to court with you today. After the anime, it will probably be hours of poking at testimonies trying to find the way they want you to get the witness to change his testimony so it's exactly perfect and you can point out the contradiction you already know about because you saw it happen in thirty seconds in the anime. In the first episode, it was basic stuff. This was a tutorial case. It will get more interesting. However, if you were bored by the anime, you're probably not going to want to dig through all the cases to laugh forever about things like a ridiculous conversation about who does and does not like Detective Gumshoe's lovingly made weenie lunch. Enjoy the cliff notes version. Or don't. Just don't expect it to quite live up to playing a sprite game on an old-school DS when people still had dialup internet and playing games on your cellphone meant your invincible Nokia had Snake pre-loaded. I'll be honest, I don't remember much about those years. Seems to me I wasted a lot of it playing silly games about lawyers. I really liked it. Saw a lot of defensive reviews so I went to look and see why they were defensive, reading the one star reviews. First, and I don't know if/when they get into this but its a distopian future. The court system gives you 3 days to defend your client or they are automatically guilty, and most lawyers only care about victory. Second, this is a fairly good summary of the first case, which is a tutorial style case, so yes, in his first defense case, his mentor walks him through it. <Shrug> Its a video game tutorial. Although I never got into the game and such, I found Ace Attorney super intriguing! I only watched it out of sheer boredom and curiosity but once I watched it, I took a keen liking to it!